FORTUNE -- Whenever we go through a major change in our culture, it seems we have to adjust to 'the new normal.' And today is no exception -- as the U.S. economy struggles to recover from the financial crisis, Americans are being forced to reckon with more 'new normals' than we'd like. Of course, we adapted to 'new normals' long before the phrase became cliché. According to a Factiva search, one of the earliest references came in a Newsday article in 1988, in which 'the new normal' referred to the realities of single parent households and the need for more government-funded childcare. After September 11, 2001, the 'new normal' referred to the vulnerability of a nation changed. Today it's everywhere. A search for the phrase on the New York Times web site yielded 11 results in just the past five days. It's not easy to change Americans' financial habits permanently, and 'new normals' don't always last. Fortune found five that just might stick, at least for a while. With the jobless rate standing stubbornly close to 10%, it's tough not to wonder if high unemployment could be a long-term fixture of the American economy. With little to no hiring in the private sector, it almost seems like the only new jobs out there are -- well, devoting the day to finding a job. 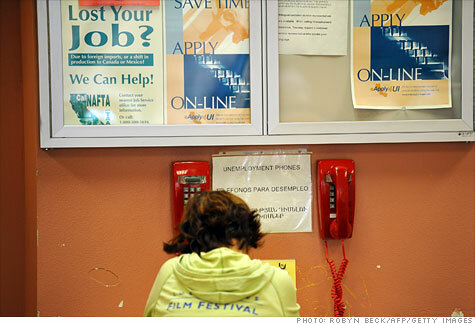 The Obama administration has been speaking out against joblessness as the 'new normal,' saying the problem is cyclical. Economists predict that unemployment will drop to 8.7% by end of next year, and by 2013, it will fall to 6.8%. Even if the predictions pan out, that's no easy target. A University of Maryland business professor this month told The New York Times that the economy would have to add 300,000 more workers a month over the next three years to get the jobless rate to fall to the administration's 2013 target. Earlier this year, when the economy made a brief comeback by growing at a healthy 3%, it added fewer than 100,000 jobs a month. When the jobless rate will return to pre-recession levels of about 4.6% (as it was January 2007) remains to be seen. Buying a home may never be the promising investment it was before the crisis hit. Gone are the days of looking at a lovely Cape Cod and seeing an instant piggy bank. Between 2006 and 2009, home prices fell more than 32%, according to the S&P/Case-Shiller Home Price Index. And just when it looks like the gravely weak housing market is beginning to stabilize, we hear more bad news. In its latest monthly report released July 27, Case-Shiller warned that a broader look at home prices over the past year haven't shown sustained recovery, even though the index surprisingly bumped 5% compared with May 2009. Meanwhile, it appears keeping up with the Jones' no longer means having a mortgage. The idea of renting is okay, and in many cases, preferred. Between 2004 and 2009, the number of renter households rose nearly 10% or by 3.4 million, according to a 2010 study of the Joint Center for Housing Studies of Harvard University. The rise of the renting class might be here to stay. If paying down debt and saving more is the 'new normal,' this might not be such a bad thing, at least in the long-term. Americans overspent for too long, and that's largely what got us into this financial mess. In June, credit card balances fell by $4.5 billion, or 6%, according to the Federal Reserve, marking the 21st consecutive month of declining balances. Meanwhile, personal savings have risen to 6.4% of after-tax incomes, about three times higher than it was in 2007. Of course, all this saving isn't exactly helping our economy in the near term. But if we're more responsible spenders after we emerge from this economic malaise, we'll save ourselves some more pain in the future. With high unemployment and a preference for saving more as possible mainstays of the U.S. economy, more of us are also likely to vacation closer to home. Though some consumers are expected to travel more this summer than last year, when the staycation officially became a trend, many are driving instead of flying and they're also spending less on whatever trips they do take. But more are opting to stay home entirely. In a USA Today/Gallup Poll released in May, 27% say they plan to travel less this summer than last, compared with 18% who say they'll travel more. More than one-third do not see much change in their travel plans. Depending on whether or not President Obama has his way, the nation's top earners (what some might call 'richest') could see higher taxes as the 'new normal.' In an effort to reverse the huge tax breaks enacted under the George W. Bush administration, Obama's plan would mean people making more than $195,550 in taxable income and joint filers with taxable income of more than $237,300 would be pushed up into higher tax brackets, from the current 33% and 35% brackets to 36% and 39.6% brackets next year. While some argue this could further hamper an already weak economy, others say this new normal could also help reduce the country's huge budget deficit. Perhaps this new normal isn't so much about higher costs for the so-called rich but rather an equalization of the nation's tax structure.